We don’t want to sound like a broken record but we can’t say enough how information destruction and protecting confidential data, applies not only to paper documents but also to electronic media destruction such as credit cards, SIM cards, media equipment, CD’s, DVD’s, hard disks and hard drives, both external and within laptops and computers. Disposing of electronic media in the right manner also applies equally to private individuals and small and large corporations. Individuals are at the same risk of their electronic media holding information such as credit card numbers and personal data that must not fall into the wrong hands. Ensuring confidential data does not fall into the wrong hands when being disposed of is becoming more of a risk every day. Fraudsters are using technological advancements, and the public’s lack of knowledge, to their benefit to steal confidential information and use it maliciously. With electronic data, company’s responsibilities to comply with the Data Protection Act 1998 are the same as paper documentation. It is essential the responsible destruction of electronic media can be verified when disposing of equipment. Not only is there worry that fraudsters could recover confidential data and use it maliciously themselves, for IT equipment there is also the illegal practice of unscrupulous companies offering free computer recycling and exporting the equipment out of the country. 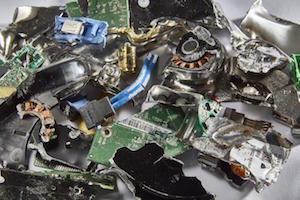 When using a local recycling centre to dispose of electronic media, computers and laptops, you are directly responsible for ensuring any personal data is removed and not recoverable from the equipment. The safest way to ensure you are disposing of data securely is to use a data destruction organisation. When you use an organisation to dispose of equipment, they are responsible for keeping your data secure and confidential until the point of destruction, and then destroying equipment so that no data is retrievable once destroyed. Ensure the company has EN15713:2009 incorporated into an ISO9001:2008, Quality Management System. The British Security Industry Association (BSIA) is the trade association for the professional security industry in the UK. BSIA member companies incorporate EN15713:2009 into their ISO9001:2008 and are inspected annually by a UKAS accredited certification body. Does Shred Station comply with these standards? We comply with all the required standards for data destruction plus certifications that allow us to provide an even higher level of security shredding for organisations such as banks and government departments. We are a BSIA member and our MD, Simon Franklin, is Vice-chair for the BSIA Information Destruction (ID) Section. Contact our shredding specialists to answer any of your questions about electronic media destruction and security.